Herodotus's great work is not only an account of the momentous historical conflict between the Greeks and the Persians but also the earliest sustained exploration in the West of the problem of cultural difference. 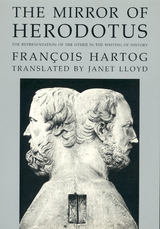 François Hartog asks fundamental questions about how Herodotus represented this difference. How did he and his readers understand the customs and beliefs of those who were not Greek? How did the historian convince his readers that his account of other peoples was reliable? How is it possible to comprehend a way of life radically different from one's own? What are the linguistic, rhetorical, and philosophical means by which Herodotus fashions his text into a mirror of the marginal and unknown? In answering these questions, Hartog transforms our understanding of the "father of history." His Herodotus is less the chronicler of a victorious Greece than a brilliant writer in pursuit of otherness.